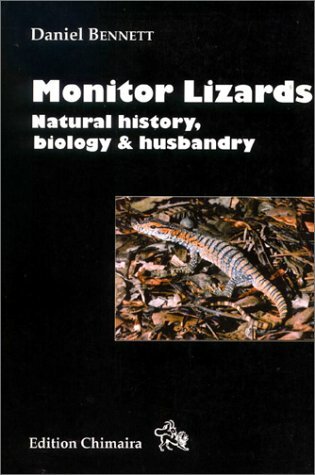 This is a great academic book.It is a much-needed update from Bennett's "Monitor Lizards: Natural history, biology & husbandry" (1998), which has been out of print for a number of years. Most known facets of monitor biology are described for each species in Pianka and Kings' book, with each species being addressed by a person familiar with the species.Captive issues are addressed almost solely by a European audience, which is unfortunate since there are some very successful monitor herpetoculturists in the United States who could have made the captivity dimensions of this book far more respectable. The book's only fault worthy of mention here is that of photograph quality.You can likely find better photos via pictures of pet monitors on MySpace or Photobucket!Not only are most of the photographs of inferior composition, but the print reproduction is terrible - very hazey.The photographs seem more for being able to say "Look, we pictured each species" rather than "Look, you can use these photos to properly compare and IDENTIFY species. "With these photos, your ability to do the latter is limited.Just the same, I don't feel this fault is so heavy a detractant to warrant deleting a star from its rating. Very good book.Monitor biologists likely already have their copies.Monitor pet keepers who wish to apply common sense and integrate their species' natural ecologies into the captive regime should have this title. The book has a lot of good information and is probably the best springboard to find more information on Monitors and Tegus.It doesn't have nearly enough information on Tegus and a reader would be lead to the conclusion that Tegus and Monitor lizards are very similar.This is not the case.They are very different.They are both intellegent lizards that look similar but that's where the similarites end.Unfortunately the only better source of information I've found is my vet and talking to breeders. the book had more info on monitor lizards than tegus.The monitors were covered well but I was interested in tegus and there was not enough info on them. 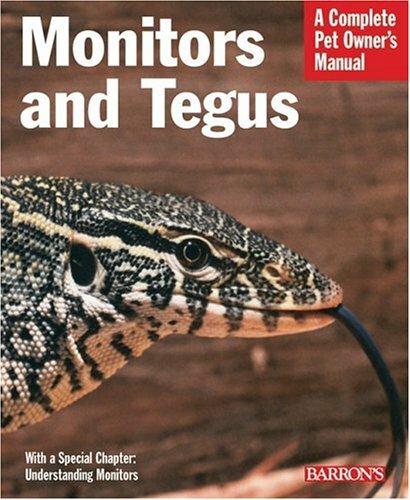 This is by far the best book I have found for tegus.It contains very detailed, easy to understand information.Although mostly focused on monitors, nearly all the information can be applied to tegus as well. Whereas monitors receive moderate treatment in this book, Tegus seem to have been (literally) added as an afterthought. Many sections speak at length about varanid behavior for several pages, only to end with "Tegus are also somewhat like this except ..." (and a few words). 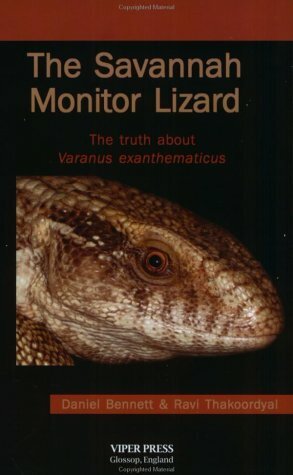 If you're serious about keeping monitors, there are more detailed and useful resources (The Natural History of Monitor Lizards, Monitors: The Biology of Varanid Lizards). This book does suffice as an account of common species and might serve as a good introduction and general reference to monitor husbandry. 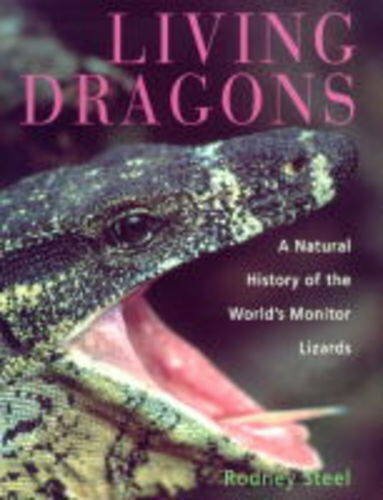 The only book about savannah monitors written by peoplewho have studied them in the wild and bred them in captivity. Theauthors provide a wealth of detail about how the savannah monitorlives in nature and how it should be kept in captivity. Theinformation on captive care is relevant to all monitor lizard species. A Must Have for any monitor owner! Best book out there! This is the best monitor book out there. Easy to read and very informative about making a proper habitat, proper diet, and proper heating requirements. Also touches on Savannah monitors in the wild and how this relates to monitors in captivity. Excellent book, a must have for any monitor owner. This is one of the best books I have read concering the captive keeping of the savannah monitor. It was easy to read and had the most information on breeding I have ever seen. I think before anyone would consider purchasing a savannah I would recommend you read this book. Bravo Daniel and Ravi!!!!!! 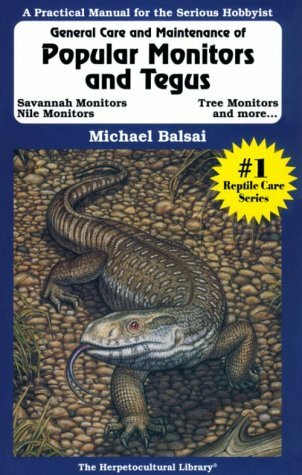 Best book about monitor lizards! 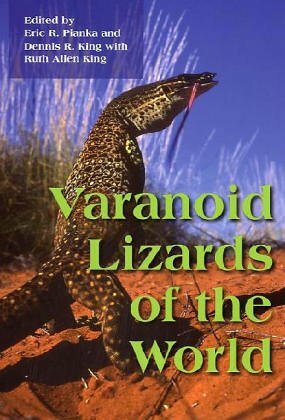 Possibly the worst book on varanid lizards ever written. Aside from the beautiful photography (most of which is mislabled), this book has to be the worst treatment of varanid and helodermid lizards ever written. The author has done little more than regurgitate outdated facts.It seems like the rest he just made up. The taxonomy is a joke, as is therest of the book. Probably the poorest book on this subject in print. This book has a lot of good information in it but it reads like a science journal.It was also written like 10 years ago so much of it is outdated (particularly in regards to breeding success).It is however a good companion piece to "Monitors and Tegus (Complete Pet Owner's Manual)"by R.D. Bartlett. This book has a wealth of information within it, and describes every aspect of monitor ownership. 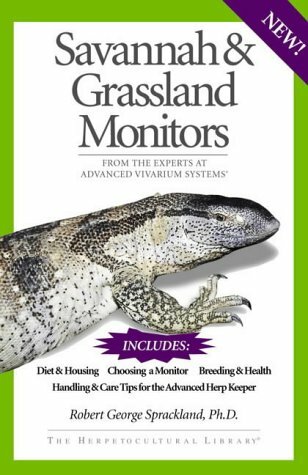 And I have seen no greater book written on Savannah monitors in particular. But, if you are interested in obtaining or own a different species of monitor, such as a water or peach-throat, the book doesn't dwell on them too long. Simply a paragraph or two deals with other individual species. Which is OK, but it doesn't discuss all the special requirements of other species, which can be important, in its generalized chapters. Yet, if its savannahs your interested in, which are by far the easiest and most commonly kept, this IS the book for you! Don't miss it! Great section on Argentine B/W tegus! 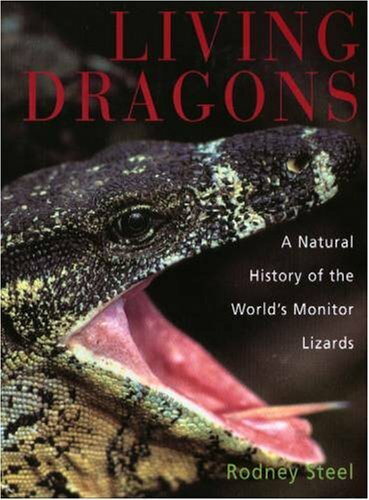 This book is a very informitive book on Monitor Lizards. Probably the best. I was lucky enough to pick mine up for $48.00. If you want learn more about Monitors this the book for you. I recommend this book to anybody who wants to learn about monitors. This book is a must have for the serious keeper, Very few other monitor books are as informative.If you can find yourself a copy, get it.You will not be disappointed in this book. Can't wait for the next edition. Originally published in 1992, Giant Lizards is a bestselling reference held in high regard within every level of the herp hobby for its authoritative and thorough coverage of lizard biology. 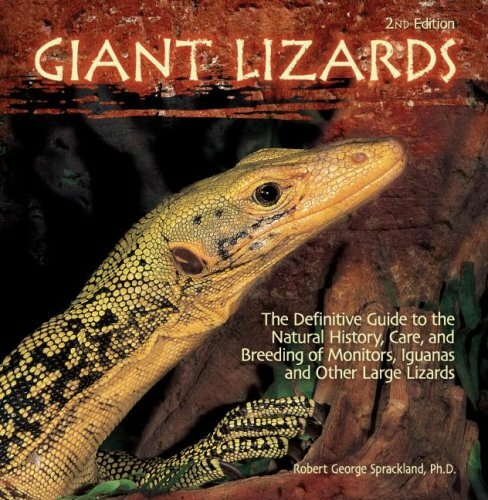 Now in a completely revised and expanded volume, Giant Lizards features all newly written information by an expert on monitors and other large lizards (defined as those reaching over 3 feet in length) and it covers over 90 species. Lizard profiles range from the relatively affordable to the extremely expensive, and from those commonly kept as pets to those critically endangered and unobtainable. Species include iguanas (including green iguanas), rock iguanas, Galapagos Island iguanas, tegus, sail-fin lizards, Gila monsters, beaded lizards, water dragons, monitors (including savannah, water, and Nile monitors plus Komodo dragons), and more. I don't keep lizards myself, but I love looking at these beautiful creatures. The pictures are absolutely gorgeous. For those considering purchasing this book, don't. There are several other books which deal with the natural history and keeping of large lizards (iguanids and varanids) out there which are more deserving of your hard-earned money. This book is filled with sloppy editing, factual errors, contradictions, poor photography, and just terrible husbandry advice. Originally published by King and Green! This book is a knock-off of the much more reasonably priced book by King and Green called "Goanna"-- down to chapter sequence, subheadings, and even poor but recognizable copies of illustrations. Thetaxonomy is poorly done, but the color photos are pretty good. The Best written monitor reference I have seen. For a book that's almost 20 years old, this is a really wonderful birds-eye view of big lizards. I remember that it came out about the same time as Vivarium magazine, the first serious lizard book that addressed herpetoculture. Yeah, a lot has happened since then, but I understand that there's a new edition coming out soon. This book is still a nice read, has great photos, and was put together by someone who really seems to like the lizaards he wropte about. 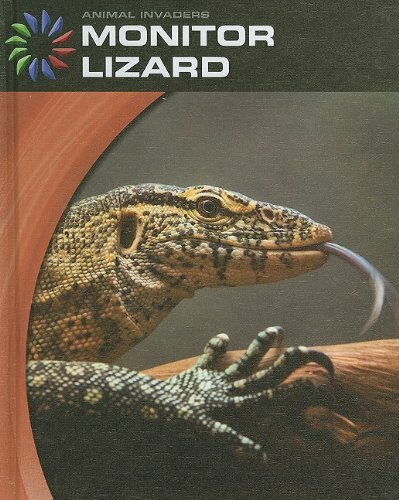 The pictures are great and some of the info on wild lizards is good, but dont try to use the info in this book to raise a monitor, it is outdated 20+ year old recycled info. For a good book on natural history get King a Greens book or Harold DeIsle book. Get Daniel Bennets new book for captive husbandry on grassland monitors. I dont think many of the authors monitors lived very long on some of his books advice and I know they didnt reproduce using that info. Dont get me wrong he has good intentions but some bad advice. Research many other books to reference any captive husbandry info contained. There are some good drawings,and some other good advice contained in it. This book is an excellent overview of the "giant" lizards and touches on their biology and husbandry. It is packed full of beautiful photographs, and all the main families are covered: the Varanidae, Helodermatidae, Teiidae, Agamidae, Scincidae, and Iguanidae.I am always amazed by the variability in skin patterns exhibited by lizards, espeically in the Varanus tristis orientalis.You can feel the author's fascination with these marvels of the animal kingdom and he also gives a brief discussion on their vetinary care. I would have hoped he would have had more to say on the "black spot" problem in green iguanasbut does not mention it. Lizard lovers and all those interested in the keeping them as pets will enjoy the book, as well as those who intend to make herpetology their chosen profession. A very well written and thorough book. Giant Lizards provides excellent, easy to understand information for those interested in Monitors, Agamids, Iguinids etc. It's a must have for any serious collector or researcher. By far, the best book on giant lizards. Reading some negative reviews by new-age know-nothings who haven't any other reviews to their credit and, presumably, advocate the abuse of helpless monitor lizards in vain attempts to make family pets out of them, I realized that perhaps a more accurate review was in order.This book, first of all, is a general introduction, not an in-depth how-to book, so thenovice who wishes to learn something of the varanid lizards has a scientifically accurate resource.Those wishing a more detailed book on the care and maintenance of particular species should look elsewhere, but this is the logical starting point for anyone not already familiar with monitors in general.I've raised and bred various species of monitors years before there were any "how-to" books on the shelves, and DOCTOR Sprackland's name has always figured largely in the business to those in-the-know (read his bio info:he is, among other things, zoological consultant to the BBC and The History Channel) and I think claims by delusional amateur hobbyists withan axe to grind that this man, who has worked inthe field of herpetologyfor decades, doesn't know what he is saying should be given the utter contempt that they deserve. I liked this book. For a change there is a book about monitors that is not just about keeping them as pets. I like reading about the lizards in their natral habitats. The price is also good, so I hope the author puts out books about the other kinds of monitors too. I helped to found the Varanid Conservation Group.The group exists mostly to correct the misinformation spread by books of this nature.I suggest buying this book only as a guideline of what not to do. Good lord! People can publish anything! Robert thinks that just because he reads something, he can spit it back out. This book by an "expert" is putrid; the care described would be considered abuse by most varanid enthusiasts. Not to mention there are many mislabeled photos etc. I am shocked this got published. It really shows how ignorant the general public is about reptiles... they seem to just accept the information because it is published by a PhD. Reading this, and considering it good is like reading a children's book about a construction company, and trying to buildahouse with it. Completely wacky info, everything mislabeled, a recipe for disaster. Get Daniel's fantastic Savannah Monitor book instead! This is a brief but comprehensive review of up to date knowledge on the biology of the Varanids. This would have to be the best reference, on these interesting and beautiful creatures, you can own. It is informative, succint and very easy and engaging to read. It covers the main aspects of varanid biology within an evolutionary frame of reference. It is set out in such a way that you can find detailed information on each of the major species, sometimes down to sub-species level. 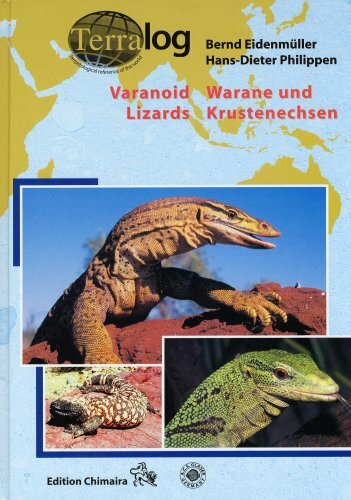 focuses almost exclusively on V. rosenbergi studies and little else on other species of varanus.has some good general data on preferred temperature ranges, metabolic rates, and other data related to scientific studies of varanids but misses the mark that most people who purchase these books are herpetoculturists/hobbyists.They want to know data on all species related to diet, humidity, habitat, etc to create a functional environment for their kept species.for that, i give it 3 stars out of 5.it misses the mark for hobbyists. I will state right now that this book is not, IMHO, an easy read, or a particularly fluid read. 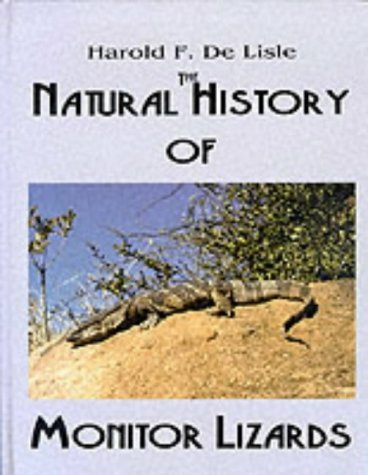 However, it is very informative, containing much information about the natural habits and ecology of varanid lizards. My main complaint is that the book seems to use V. rosenbergi as it's archetypal varanid; there are some 9 sub genera and several dozen species, and I wish that more attention had been payed to the some of the other varanids. 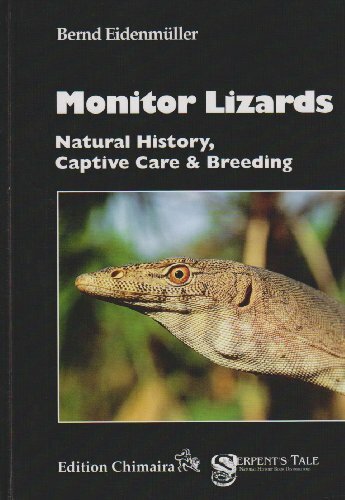 However, this is still one of the few good monitor books that's actually in print, and is worth your read weather you're an academic herpetologist or a keeper (or for that matter if you are thinking about keeping a monitor). It provides insights that are sorely lacking in most other (in print) books, espically in regards to the thermal biology, water useage, and the diet of these lizards. It's easily worth your effort to read it. The discussions about taxonomy are also great, and informative in regards to how gene sequencing is being used to establish relationships and derivations between species. 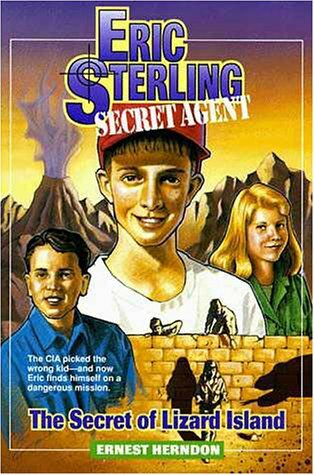 Eric Sterling Books are great! 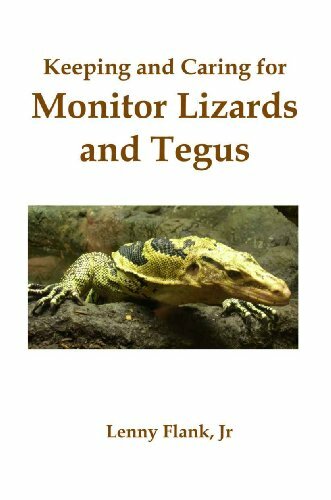 Monitors, beaded lizards and the monotypic family of the earless monitor, form the subject of this sixth volume of TERRALOG. The lizards portrayed in this volume exhibit an enormous extent of diversity as to color patterns, body sizes, and inhabited natural habitats. Distributed from North and Central America, through Africa, to the Indo-Australian region, they are native to deserts, savannas, rainforests, and mangroves. Besides portraits of all valid species and subspecies, the present book provides photographs of natural habitats, juveniles, and documents aspects of behavior.Descriptive symbols summarize the basic captive requirements for each species. With over 460 color photos and distribution maps for all species, this volume of TERRALOG is a photographic synopsis for both scientists and hobbyists and provides a unique insight into the amazing diversity of Varanoid lizards.